Lorraine Heskin and Lorraine Byrne are two young ladies with a passion for delicious food of which they have an extraordinary knowledge. They opened their first Gourmet Food Parlour on Cumberland Street in Dun Laoire, not far from where I live in 2006. The local denizens were down hotfoot to try their Gourmet breakfasts, salads, sandwiches, delicious and antipasti plates, and the place took off immediately. Eggs can be cooked anyway, I love Eggs Benedict. Cumberland sausages are used with delicious bacon. Their signature selection of posh sandwiches using bruschetta and baguettes includes Smoked Applewood Cheddar, vine tomatoes, basil pesto, reasted red peppers and mayp. Pastrami is teamed with turkey, ham, Eammenthal cheese, vine tomato and honey mustard. They do a great Club Sandwich and a French style Croque Monsieur accompanied with honey mustard. Smoked salmon is with cream cheese but what makes Gourmet Parlour so successful is that the girls use the best of produce from all over the world, charcuterie from France, Spain and Italy, cheeses from all over Europe including Ireland, olives and delicious salads, rice is from Texas, Torinto Italian produce. The girls are constantly sourcing new and interesting produce for their shelves. They do lovely cupcakes and chocolate muffins as well as rum flavoured chocolate biscuit cake, Snickers cake, strawberry and rhubarb crumble, and apple and blackcurrant tart. Their attention to details and good food has meant that they have rapidly expanded first of all to Swords in 2008 where they have opened a larger store. 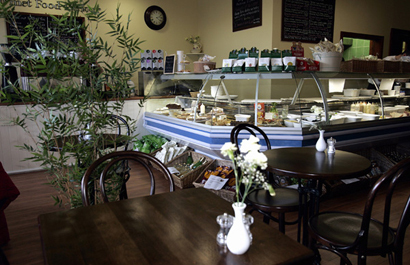 Their most recent opening has been at The Grange on Oldtown Road in Ballyboughal, North County Dublin. The Grange is a lovely location with an Art Gallery and also a shop with gifts and goodies. Now the enterprising pair are doing Tapas evenings on Fridays in Dun Laoire and Swords with really tasty dishes including deep fried calamari served with a chilli lime dipping sauce, Spanish style spicy chorizo and chicken paella, Spanish tortilla served with a spicy tomato salsa, torpedo prawns breaded and served with a sweet chilli dip. They also do a lovely Spanish antipasti plate of Serrano ham, chorizo, sun-dried tomatoes, stuffed olives, roasted red pappers and roasted garlic served with rustic bread. At The Grange they are also doing Tapas nights with live music by Roy Taylor on the first Thursday of every month but do check their website for updates. This enterprising duo are amazing, they have made such an impact on Dublin’s foodie scene in such a short space of time. FXB Grill @ Ryans of Parkgate St.